What are you investing in this week? Berkshire Hathaway? Google? Pfizer? How about investing in one of your local farms? Through a CSA, or Community Supported Agriculture, program you can do just that. When you join a CSA program, you purchase a share of the farm's crop and are in exchange provided with part of the crop each week. By joining a CSA program, you invest in a farm and, along with other members, provide a steady stream of cash to a farm when it is needed most. Most CSA programs provide a discount if you pre-pay for your share on a quarterly or yearly basis because a pre-payment allows the farm to use the cash in the springtime when money is needed for farm equipment or investment in the farm.  It's diversity means that it is constantly changing and trying new products. Most CSA programs deliver goods weekly to a spot near your home - it could be a school, someone's house, or a business. You agree to pick up your produce box each week during a pre-set window of time. You are usually asked to pay for the program at least monthly, or sometimes quarterly. CSA programs vary in price and in variety of fruits and vegetables that they provide. By participating in a CSA, you will receive a newsletter with each delivery, and often will be invited to farm events throughout the year. With most CSA programs, you don't have a say in what you get. Each week, you receive fresh and in-season fruits and vegetables. While purchasing products from a farm at a farmer's market is a good way to get to know a farm, don't make the mistake of thinking that what you see at a farm stand is the only product provided to a CSA member. Many farmers grow a product for the CSA program but for many reasons don't bring it to market. Capay Organic Farm features home and office deliveries throughout the Bay Area and Sacramento. Their CSA program, called "Farm Fresh to You," allows you to choose a regular box, a small box, or a mostly fruit box. You can also choose a "snack pack" delivery which is suitable for offices, and can be set on any schedule. With Farm Fresh to You, you can have some say in what is in your box by letting the farm know if there is a fruit or vegetable that you will never use, and a substitution will be made. This substitution policy is unique to Farm Fresh to You. Cost: $21.50 - $29/week. Delivery cost is included. This week's box includes: Mixed Cherry Tomatoes, Summer Squash, Heirloom Tomatoes, French Fingerling Potatoes, Bell Peppers, Bartlett Pears, Gala Apples, Yellow and Red Onions, and Melon. Eatwell Farm is a year-round CSA program with 11 pickup sites in San Francisco and 12 pickup sites in the East Bay, Davis, and Marin County. With Eatwell's CSA program, you can pick up a box every other week instead of weekly if you eat fewer veggies. Eatwell has recently started selling eggs which are from their farm and can be included in your box. Cost is $5.50/dozen or $3/half-dozen. Cost: $21/box. Rates shown are based on a four-box subscription. Cost is reduced if you pay on a quarterly or yearly basis. This week's box includes: Watermelon or Ambrosia Melon, Green Beans, Grapes, Green Peppers, Mixed Plums, Cucumbers, Summer Squash, Cherry Tomatoes, Fresh Thyme, and Asian Pears. Full Belly has 22 pickup sites in East Bay, Marin, South Bay, and Sacramento. They don't have any pickup sites in San Francisco. Home delivery is available for select East Bay locations for an additional $5/week. Full Belly Farm is a polycultural farm in every sense of the word. In addition to fruits and vegetables, they provide products such as whole wheat flour, lamb, and yarn for an additional price. Cost: $15/box. Price is reduced if you pay on a quarterly or yearly basis. This week's box includes: Corn, Eggplant, Grapes, Onions, Cantaloupe Melon, "Surprise" Melon, Summer Squash, and Tomatoes. Mariquita Farm and High Ground Organics join to provide a CSA box from Two Small Farms. They have 5 pickup sites in San Francisco, and 51 pickup sites in the South Bay, Peninsula and Santa Cruz. Two Small Farm's CSA runs from March through November. They provide mainly vegetables with a small amount of fruit. You can have flowers delivered with your veggie box for an additional $6/week. 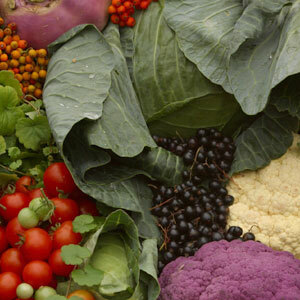 This week's box includes: Strawberries, Tomatoes, Swiss Chard, Cauliflower, Carrots, Basil, Artichokes, and Eggplant. Riverdog Farm has 20 pickup sites in East Bay, Davis, and Napa. They don't have any pickup sites in San Francisco. Their boxes include fruits and vegetables. To preview this farm's offerings, you can visit them at the Berkeley Farmer's Market on Tuesdays and Saturdays. This week's box includes: Mixed Tomatoes, Yellow Baby Watermelon, Charentais Melon, Orange Honeydew, Globe Eggplant, Armenian Cucumber, and Red Onions. Terra Firma Farm has 16 pickup sites in San Francisco and 15 pickup sites in the East Bay or Sacramento area. Their delivery features fruit and vegetables with the option to choose your box size -- small, medium and large. Cost: $13 - $29/week. Startup cost involves a $35 deposit, refundable upon timely notification of discontinuation. Rates shown are based on monthly subscribership. Cost is reduced if you pay on a quarterly or yearly basis. This week's (large) box includes: Tomatoes, Fingerling potatoes, Asian pears, Gypsy peppers, Orange honeydew, Garlic, Summer Squash, Apples, Valencias, Red watermelon, and Onions.